1. Growth-Ring-Coaching.com is a "web application." Which is to say, it is a database-driven, highly-interactive site intended for long term personal knowledge management. 2. Take the time to explore "Essays" and "Tools" from the left side menu, or you will miss the benefits offered by the site. 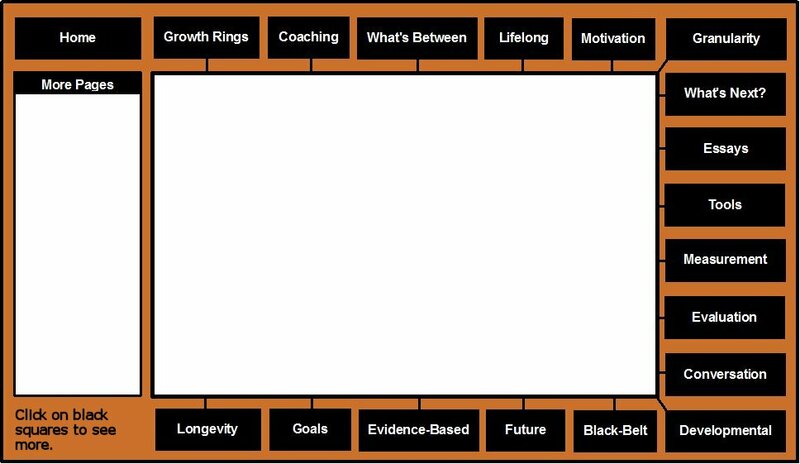 Click on the black rectangles to see more information regarding this site's philosophy of coaching. Welcome to growth-ring-coaching.com, a web site dedicated to helping you make better decisions regarding the conduct of your entire life. I divide decision making into two parts: structure and content. I argue that "structure" is common to all humans, all homo sapiens. "Structure" can be researched and written about generically; it's common to us all. This web site reports on the current literature regarding what is common to us all as it relates to controlling our own behavior. I'm a trained psychologist (Ph.D.: Learning, Memory, and Decision Theory), a trained decision maker (MBA), and a trained coach. As such, I have a strong background in the evidence and theories that have been presented regarding human decision making and the thought processes guiding behavior. This is an evidence-based coaching web site. The "content" part of the decision making is up to you. You make the decisions; the web site records them, displays them, and helps you manipulate them over a lifetime. "...in order to live man has to think, whether it pleases him or not. If he thinks badly, that is, without a sense of personal and intimate veracity, he lives badly, in pure anguish, full of problems and uneasiness. If he thinks well, he is well adjusted within himself; ... But it is not man's highest mission to be acute; he is required simply to resolve his life loyally and sincerely."